To activate the front windshield defroster, press the front windshield defroster button located in the center facia switch panel. The indicator on the front windshield defroster button illuminates when the deicer is ON. The front windshield defroster automatically turns off after approximately 20 minutes or when the ignition switch is turned off. 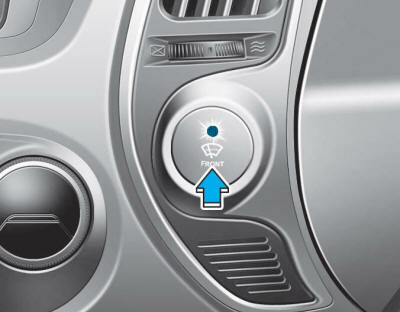 To turn off the defroster, press the front windshield defroster button again.